Instant Trendline Filter (Alpha 0,7). 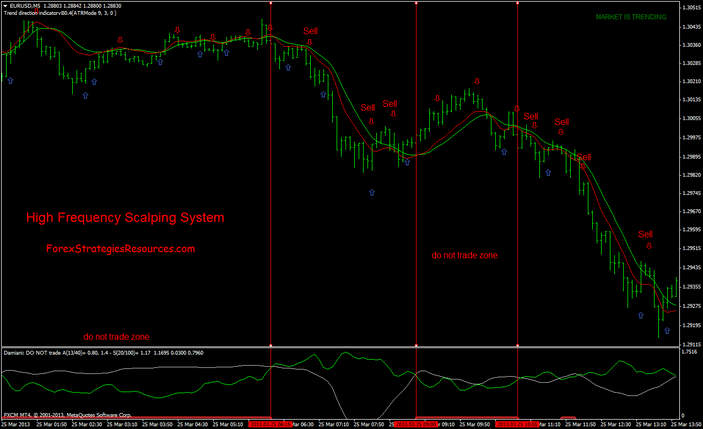 HFT Metatrader Indicator is a scalping system . Open position right on signal (arrow+alarm), on the display we see also target price 1, target price 2 and stop loss. 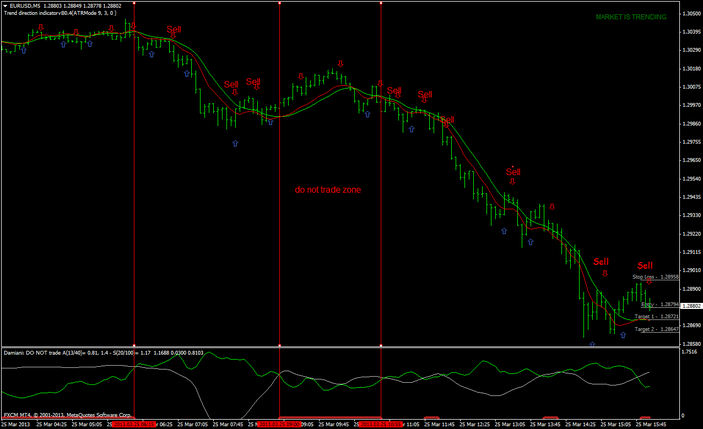 Open position right on signal (arrow+alarm), on the display we see also target price 1, target price 2 and stop loss. in top right corner we se also if matket is flat or trending but in this scalping system is not important because we use other two indicators for filter: Damiani Volameter and InstanTrendline Filter. Instant Trendline Filter, red line> green line. Instant Trendline Filter, red line< green line. Exit position see indication on display of HFT indicator (targets and stop loss). This Scalping System is good also with Time Frame 15min. Volatility forex Damiani_volatmeter v3.2. This is ab great indicator as filter of volatility. Looks interesting, how exactly do you identify the no trade zone? Is it when the message in the top right says ranging or something like that? Or is it something else? Is it necessary to install all attachments filters: Damiani Volameter and InstanTrendline Filter? The Expert Advisor, how to set it up for better profits? Is it possible to make it work on M15 M30 H1 H4. That would be great. I like how it gives you entry, S/L and TP1,2 and 3. @Alexander - how did the EA do in testing? How much would people here be prepared to pay for an EA of this? Great indicator this HFT. It´s possible to get mql code of? Does the arrow repaint or not ?Moreover it appears at the opening of next bar or delay ? Thank you for the great indicators. Great for avoiding the whipsaws when scalping or adding to positions. @ Marc: The "do not trade zone" is where the white line is above the green line. Automating this strategy would be good!